Summary: In this delightful memoir, the book critic for NPR’s Fresh Air reflects on her life as a professional reader. 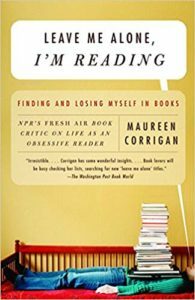 Maureen Corrigan takes us from her unpretentious girlhood in working-class Queens, to her bemused years in an Ivy League Ph.D. program, from the whirl of falling in love and marrying (a fellow bookworm, of course), to the ordeal of adopting a baby overseas, always with a book at her side. Along the way, she reveals which books and authors have shaped her own life—from classic works of English literature to hard-boiled detective novels, and everything in between. And in her explorations of the heroes and heroines throughout literary history, Corrigan’s love for a good story shines. I love reading about books and reading and that’s definitely what this book is about. I didn’t rate it 4 or 5 stars thought because it’s mostly about fiction and I mostly read nonfiction so I couldn’t identify with most of the books. Also you can tell at times that the author is well educated (she does work for NPR after all) as there were words I didn’t know (which is rare) and just the way it read was very literary. These aren’t inherently ad things, just not what I prefer. It was a nice read and reminded me how much I love reading. Buy Leave Me Alone, I’m Reading from Amazon.com and help support the blog.